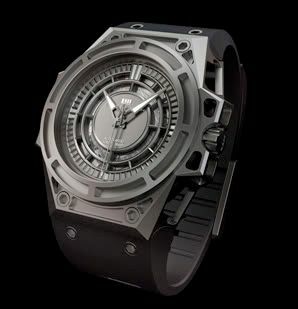 Mid-November, I blogged about Linde Werdelin, a brand that has its focus on toolwatches for die-hards. 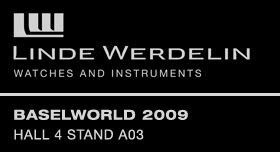 This coming Basel, they are expanding their collection with the Linde Werdelin Spidolite Watch. This watch will be available in titanium, titanium DLC (limited edition) and in titanium with a skeleton dial (also limited edition). The best part is (in my opinion), the movement for the sekeleton dial version. This movement is a 1970’s automatic mechanical movement, modified by Svend Anderson. Svend Anderson is member of the AHCI (Acad?É¬©mie Horlog?É¬®re des Cr?É¬©ateurs Ind?É¬©pendants). The Spidolite skeleton dial version is a 46x49mm wristwatch, with a height of 12mm. This hockey puck in titanium has a see-through sapphire crystal case back that shows the 42 hour power reserve movement by Svend Anderson. The watch is water resistant to a 1000 feet (300 meters) and has a textile strap with titanium buckle.